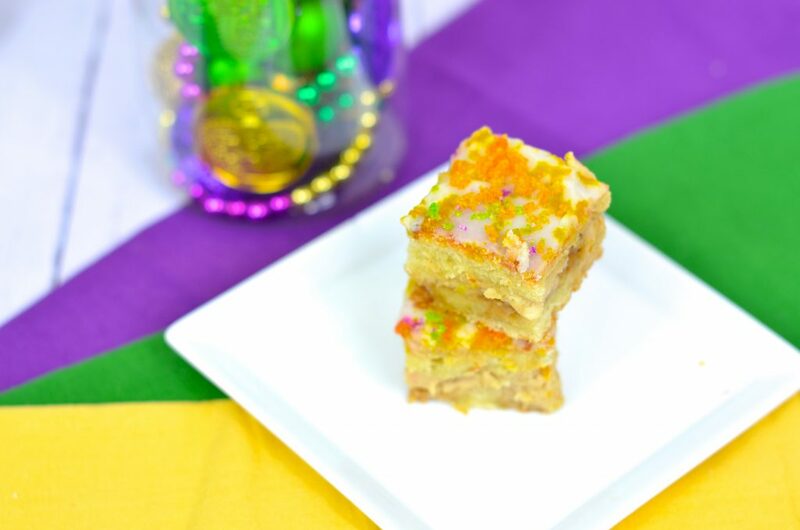 A low carb, gluten free peanut butter king cake cheesecake bar recipe with simple ingredients the entire family is sure to love. It’s about that time to start planning when and where we are going to park our cars for the parades! Get those purple, green, and gold shirts on as we are ready to pile on those long beads. What was the first Mardi Gras parade you ever attended? Growing up in Houma, LA, I can’t tell you the first parade I went to because more than likely I was in diapers. I can tell you the first parade of each season I would attend was the Krewe of Hercules. I distinctly remember the parade was on a Friday night, and some years, I was wearing shorts, and other years, I was bundled from head to toe. 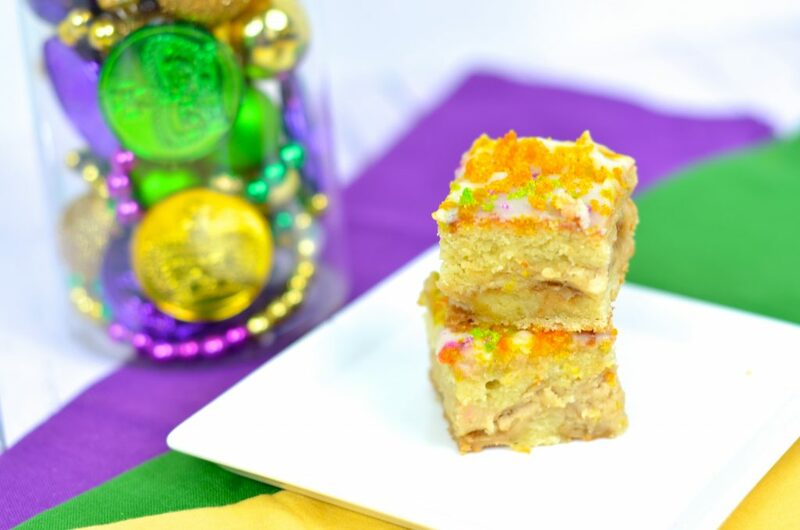 Arriving home, I was ready to have my slice of King Cake (my favorite was always Cannata’s King Cake ,and I wonder if that will ever change. Even though my fabulous friends at Randazzo do ship their amazing king cakes, I always long for my favorite from Cannata’s. While I grew up going to parades, this experience was very new for my Yankee husband (ok, he is from the Midwest), Greg. His first parade took him to the Krewe of Highland in Shreveport. 15 years and 2 kids later we are ready to attend some family friendly parades, and just as we have various parades to attend we have ton of different king cake flavors we can purchase. 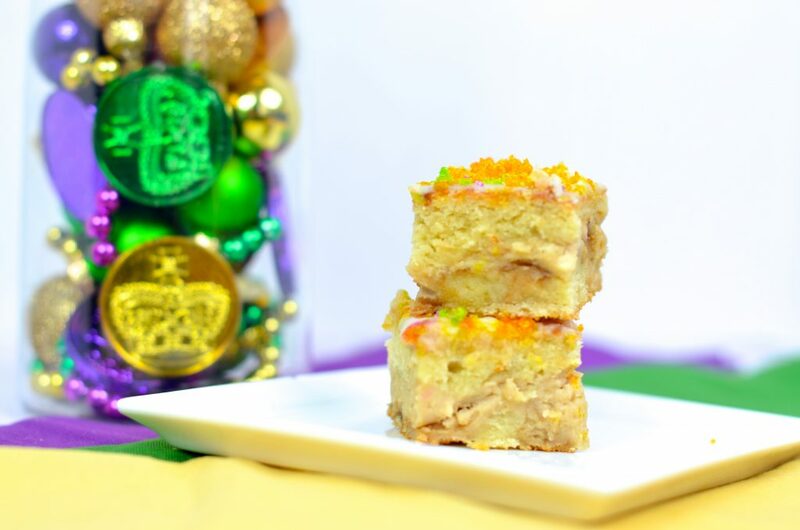 A few weeks ago I went to the drawing board to develop various king cakes and started with my Low Net Carb King Cake Bread Pudding, continuing to my Low Carb King Cake Cheesecake Bars. 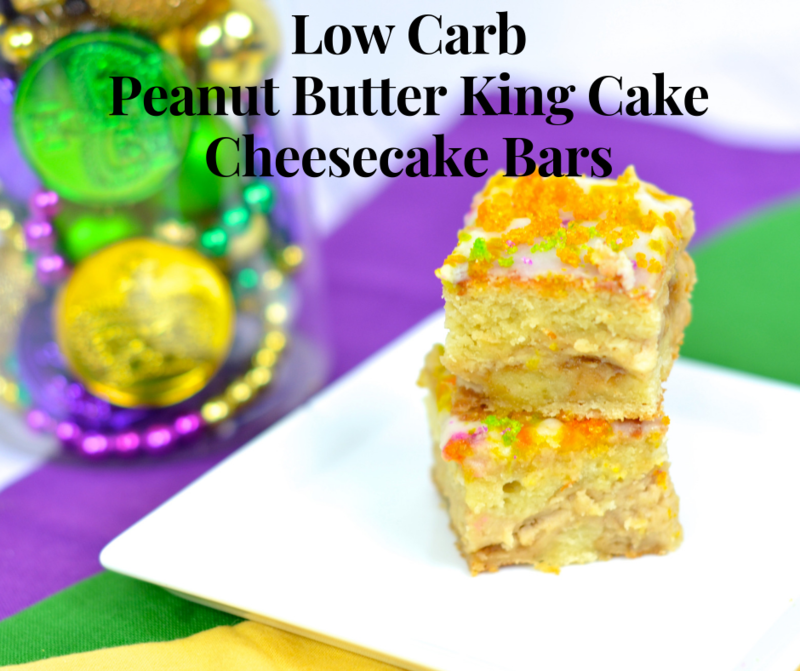 The Krewe of Skinny Louisiana continuing this trend with our Low Carb Peanut Butter King Cake Cheese Cake Bars. I love King Cake. I love peanut butter. Let’s combine the 2 flavors! 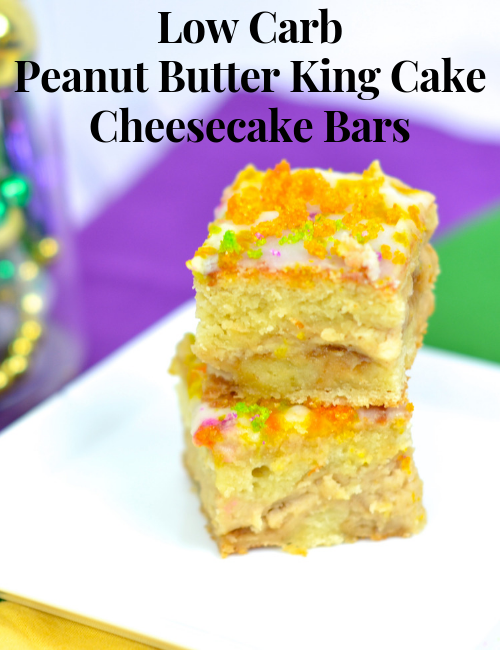 Peanut butter in it self is incredibly popular, from our love of a spoonful from the jar, or in peanut butter fudge, so it naturally sounds like it would be perfect in our Low Carb Peanut Butter King Cake Cheesecake Bars. Swerve granular is an amazing keto sugar replacer in baked goods, while our Swerve confectioners sugar replaces powdered sugar in items such as dips and frostings. Swerve brown sugar replacer is used in our filling. While my fabulous keto friends will keep the full-fat versions of cream cheese (please do if you are following keto), I used a light cream cheese to keep the calories down in this dish (yes, I look at calories). No fear, light cream cheese does not have any added sugar. Light cream cheese is a healthy alternative to cream cheese with 35 calories tablespoon compared to 51 calories in 1 tablespoon of cream cheese. No all peanut butters are equal! While many of us love peanut butter as a snack, we have to be very careful in the type we select. Many of our peanut butters have added sugars. Look for a peanut butter with no added sugar. For a keto friendly dish, use almond butter. We love eggs in the Skinny Louisiana kitchen. Eggs offer us an amazing source of protein. No replacement needed in our eggs. While I used my Kitchen Aid Mixer, you can easily use a hand mixer. In a large bowl (or in mixer bowl), combine water, butter, sour cream, vanilla, egg, egg yolk, and butter. Beat with mixer on low for 2 minutes. Turn mixer on low and slowly add almond flour, Swerve, salt, and baking powder. Beat on low until combined, about 2 minutes. Place aside. Steps of Peanut Butter Cheesecake Layers. In a small bowl combine cream cheese, peanut butter, and Swerve. Beat with a hand mixer for 1-2 minutes. Place aside. Preheat oven to 325. Line 8 x 8 pan with non-stick aluminum foil. Spray with non-stick cooking spray. Using a spatula, scoop 1/2 flour mixture and spread in pan. 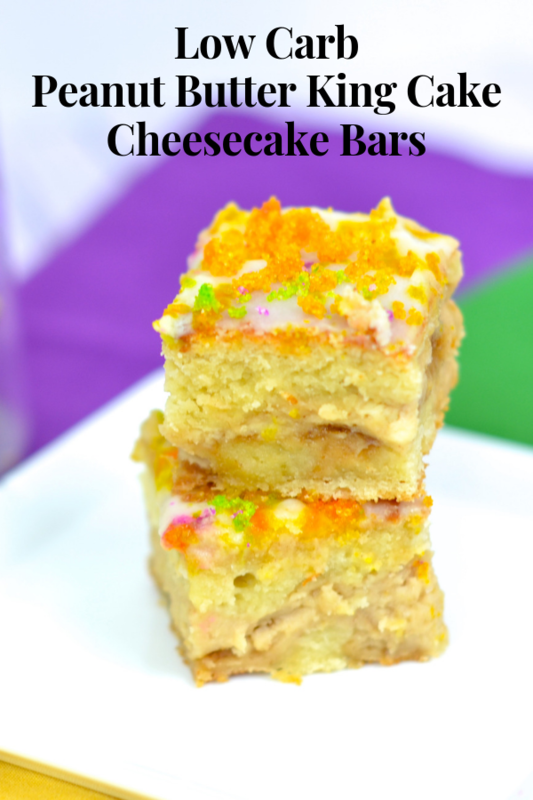 Layer with peanut butter cream cheese mixture. Layer with remaining almond flour mixture. Bake in oven for 35-45 minutes or until set. Remove from oven and cool. Once our dish has cooled, we can make our simple glaze frosting with Swerve confectioners sugar and Fairlife milk. For fun we made purple, green, and gold colored Swerve sugars and sprinkled on top. To make this, place a tablespoon of Swerve granular sugar in a ziploc bag. Add 1-2 drops of food coloring. Mix. Line an 8 x 8 pan with non-stick aluminum foil. In a large mixing bowl, combine sour cream, water, vanilla extract, eggs, egg yolk, and butter. Beat with hand mixer on low for 2 minutes. Turn off mixer and slowly add dry ingredients – almond flour, Swerve granular sugar, baking powder and salt. Combine with spatula. Beat for 2 minutes on low or until all ingredients are combined. Place aside. In a small bowl, combine light cream cheese, peanut butter, and Swerve brown sugar. Beat for 1-2 minutes. Place to the side. Layer 1/2 flour mixture, peanut butter cream cheese mixture, and 1/2 flour mixture in pan. Place in oven and bake for 45-55 minutes OR until set. While cooling, mix Fairlife milk and Swerve confectioners sugar. Pour glaze on cheesecake. Calories: 220. Fat: 19g. Saturated fat: 4.5g. Cholesterol: 35mg. Sodium: 30mg. Carbohydrate: 6g. Fiber: 3 g. Sugar: 2g. Protein: 8g.